Earth holds the secret to connect to these other realities? In the new age children's fiction book, Jonar & Kitty: The Timekeepers Void author and illustrator Bobbie Richardson has crafted an enchanting tale that draws the reader into the true beginnings of a new world full of magic. We follow the story of Jonar & Kitty, two teenagers who don't fit into the system but find each other on the same path - a path that takes them through a porthole to a new reality, full of magical beasts and animals that can talk, mysterious lagoons and lost souls. A reality that always existed and needs their help. Supported by a series of imaginative illustrations from Bobbie Richardson, Jonar & Kitty is an original and enjoyable adventure for YA readers. Question: What inspired the story of -Jonar & Kitty – The Timekeepers Void'? Bobbie Richardson: I have written this book to enhance our lives, by helping us to step out of the program of this reality and to entice children to think outside the box and teach us all that it's okay to believe in magic again and that anything is possible. -Jonar & Kitty' can provoke a child's mind into realizing his or her full potential. 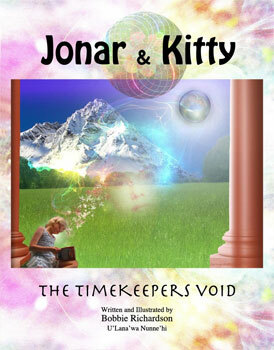 Although it is written in the form of a fantasy adventure and is considered fiction, I have also infused a lot of my own experiences of seeing beyond this dimension into the plot as -Jonar & Kitty – The Timekeepers Void' is where Quantum Physics meets Spirituality meets -Alice In Wonderland', written to find the truth behind our conditioned mind. Question: Why did you want to create a new age children's book? Bobbie Richardson: My journey of experiencing many things outside what would be perceived as a normal reality lead me further down the rabbit hole than most. At the beginning I found this gift hard to incorporate, and as I didn't want other children to be mislead away from their natural gifts, I wrote this book and another called -Imagine Holding Hands', a picture book created for younger readers. I wanted to share many of my experiences of visitations from other dimensional beings and messages given to me in vivid dreams so I decided to share my information in the form of a fantasy book so that any child could read it as such or see more into it and recognise or accept their own gifts. Question: What do you hope children take from -Jonar & Kitty – The Timekeepers Void'? Bobbie Richardson: I would love to see more children accept their natural abilities to become more intuitive to ignite the right brain functions and become more balanced and still within, to become more imaginative to create the reality they want, to connect with their environment and learn more about themselves from it, to empower themselves to once again take responsibility for their own thoughts and to recognise that our reality is more than what is normally taught. Question: What was the best part about creating the characters of -Jonar & Kitty – The Timekeepers Void'? Bobbie Richardson: I feel I have channeled most of the characters and was given conformation with this. When I had just finished creating the character Loopnit a funny dwarf-like creature that had the ability to teleport, I went to a friend's place a few days later. We all sat around a huge bomb-fire that was so big it seemed to breathe. I had a feeling that something was within the fire that wanted to show itself so I asked, 'show yourself," then took a photo. The photo revealed Loopnit, recognisable as the same character I had just drawn. Some characters, like Spirit the panther, also came to me years before in dreams as well many of the places I had visited including Avalon so I knew what it felt like to be in a place where your mind was so still you could manifest what you wanted.